Not so long ago my friend and I went to a M. McDermott show at a small venue. Our Memorial Opera House has recently become a place for many types of performances, and it proved the perfect space to see such a prolific singer/songwriter. Growing up, I was surrounded by the music of poets; Bob Dylan, Willie Nelson, Pete Seger. I remember sitting in front of my parents’ record player listening to John Denver, all the while staring at his young face and perfectly round spectacles. I can close my eyes and still visualize the album cover in my hands. When Michael McDermott began playing, I was transported back to my parent’s house, buckled parquet flooring leaving marks on my knees as I kneeled before the hundred or so records of some of the best singer/songwriters of all time. I was transfixed by McDermott’s lyrics and the poetry of the music. I could imagine McDermott’s exterior; the streets of Chicago, riding the L, playing the Double Door. I was enamoured by McDermott’s honesty regarding his struggles with addiction, the awe experienced in parenthood, and the way he has used music to express his questions about mortality and passion. Throughout the concert he would stop to reminisce and expand on the songs rhetoric. His set was engaging, hilarious and at moments painfully raw as he would disclose his trials. With his wife by his side playing the violin, the audience was enthralled by the love McDermott expresses through his music. It seems I have put the blog on a backburner to focus on another passion; my little online store on Etsy. The shop is http://www.etsy.com/shop/MuckaDuck; we sell handmade, repurposed do dads. Welcome to “Muck a Duck” our online store for jewelry, pillows, and art. Everything is handmade using repurposed materials in addition to new elements. We met at the age of sixteen and realized we were kindred spirits. Partially due the fact we know too much about one another we have remained loyal compadres. At various times in our lives we married, had careers as an attorney and a social worker, had some savage beasts we love as children and then returned to our roots-soul surfing. We create tid bits and throw it into the world and hope someone appreciates it. Thanks for following our misguided adventures. This started as a happy accident that became a little business. Feel free to send us a shout out and check in with us as we add new b’s to our baubles. Check out the shop and give me your feedback! 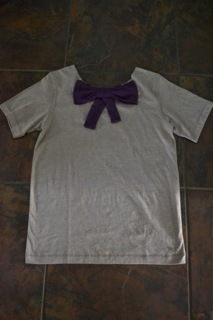 Recently my friend and I whipped up this bow shirt. I thought it was cute, well perhaps not. My husband said it looked like I could be an announcer on Telmundo and my sister said it looked like part of a costume! I do think now we should have decreased the size of the bright purple bow! I believe I am innately bored by many things. Although I appreciate silliness, I tend to find most things wry and just okay. People will criticize this but it’s honest which tends to be the point of everything. Further I would like to add I have read a million self help books and embrace therapy to find the ‘art of happiness and fulfillment.’ I believe in the value of living in the moment. I just require more practice. I write this post with admiration for the people around me who share this optimistic vantage point. I am in unbelievable envy of merriment and giddiness. Although due to me being myself, I rarely think people’s gaiety matches the life event taking place. Most people who exude abundant happiness seem to approach every day with the same flavor. Of course it’s unseemly to tell people to tone it down when they express happiness from working out or eating at a restaurant. Today was one of those days where I felt perhaps my true family is with the curmudgeon down the street who waits for the mail-person to deliver in order to rant about his misfortunes. I may not share his negativity but I do get him. Today my six-year-old and my husband waited roughly three hours outside for dirt to be delivered. My husband was convinced the truck was right around the corner at 2pm. By 4:30 I crossed my arms and stepped outside. I looked at Mike and said “really, you have nothing better to do.” I felt like I was running a group home with my family waiting outside for something, anything to take place. I say this with tenderness because I worked in group homes for years while in college. The residents rarely have an agenda except to wait. My other daughter is far more like myself. She always seems to have intent and purpose. Mike asked if she wanted to come outside and she asked “why.” When she heard the answer was waiting for dirt, she said “no, I will take a bath.” She’s three. I am bemused by my in home residents; daughters that differ so completely and love me entirely. And I feel so lucky in love with the goofiest time jack that is Mike. You know where you are when your day turns from ordinary to wish I had a redo?! My day fell into the redo category quickly. It began with a school aid having to pry my daughter off of me when I dropped her off this morning. Anni has adamantly decided she does not like school and would rather stay home and draw all day. She also has a rather rigid teacher for her first grade year and Anni is adjusting to new expectations. This is the aspect of parenting that is difficult; teaching your child to nurture their sensitivity in tandem with adaptation of structure. Academic settings in the elementary schools do not typically foster emotional sentiment and creative endeavors. Next pitfall was my physical discomfort while marathon training. I am having recurrent stomach issues while running that make performance arduous. It’s beyond frustration when the human body reminds us how vulnerable we are. This leads to my next sidenote; time is so limited. Self explanatory, my to do’s seem longer than the wane of daylight hours. Other WTF today, my husband flys out again for work tomorrow. With only a day’s notice, I feel tired. When I vented to a friend, she remarked “at least he has a job in this economy.” Sometimes these remarks minimize the aggravation one feels privy to express. Yes, truth be told we are lucky my husband is gainfully employed. However I felt like telling my friend that was not the irritant expressed so let’s focus on the topic. To wrap it up the direct tv technician arrived unexpected as my dog decided to go on a garbage binder in the neighborhood. I broke three Pyrex containers. As they shattered in the kitchen my three-year old urinated on the couch. Just when I wanted to lock myself in the bathroom and drown myself in my uncleaned toilet I hear a tribute on tv for the victim’s families of September 11th. Here is what is important; I am able-bodied and can run for accomplishment not out of need, a marriage based on respect and commitment, children with big ideas that may lead to even bigger dreams, a home that is so much more than a house and friends wise enough enough to express their love not just their opinions. Tried this recipe the other night and it was awesome! However, there are sooo many steps. I cut to the chase and made sauce ahead of time and put it on top of chicken in casserole dish. I heated up dish in oven at 350 degree’s for 15 minutes prior to dinner. Yesterday as I stood in the kitchen trying to figure out what to make for dinner I wondered to myself, how do those people do it on those shows where they are given random ingredients and are suppose come up with something genius. I think I stood there for a solid 20 minutes looking in the cupboards and staring into the freezer hoping that I would be struck by some ingenious idea. Then I saw the oranges and it hit me “O-raang Shh-ikun”….that is orange chicken if you can’t understand the accent. 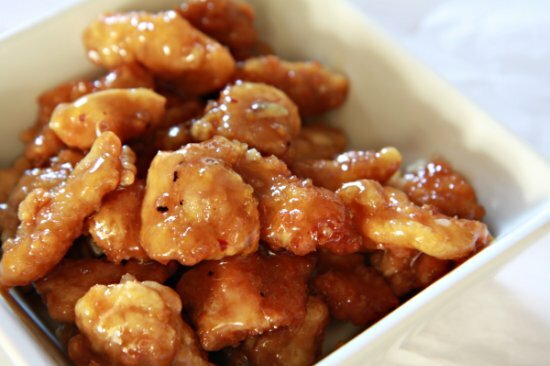 I love orange chicken and I almost always order # 14 Orange Chicken when we order Chinese take out and I wondered to myself if I could make it better at home. This recipe most definitely delivered! Ha ha chinese food…delivered….get it? Am I a dork? The sauce is sweet, tangy, there is no lack in orange flavor and the red pepper flakes give it just a touch of heat. I thought I would dredge the chicken in corn starch instead of flour to keep it light and also in panko breadcrumbs to give it a little crunch. It was the right call, the chicken came out lightly breaded and still held up a bit of a crunch when tossed in the sauce. Delicious! Combine corn starch, salt, and pepper. 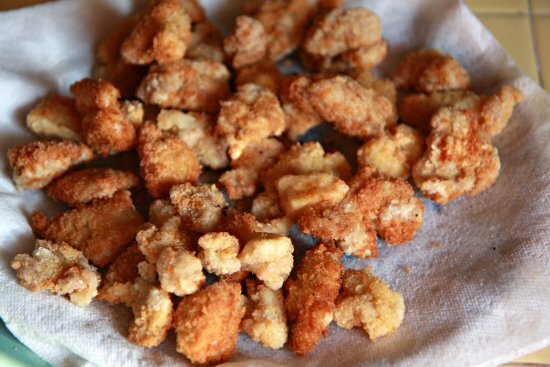 Prepare a bowl with beaten eggs, panko bread crumbs and another with corn starch. Dip chicken in egg mixture, dredge in cornstarch, then again in the eggs and finally in the panko bread crumbs, set aside. Heat pan with vegetable oil to 375 degrees, fry chicken in batches until completely cooked. As you finish each batch drain cooked chicken in a paper towel lined plate. 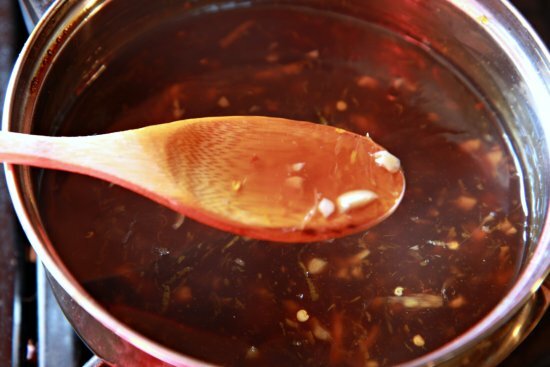 In a large saucepan combine 1 ½ cups water, orange juice, rice vinegar, and soy sauce. Blend well over medium heat for a few minutes. Stir in brown sugar, orange zest, ginger, garlic and red pepper flakes. Bring to a boil. Combine 3 tablespoons of cornstarch with 1/4 cup of water and mix thoroughly. Slowly stir cornstarch mixture into sauce until it thickens. Pour sauce over breaded chicken, and if desired garnish with green onions, which I would have used but I didn’t have any. We loved, loved, loved this and I had to refrain totally gorging myself. At first I wasn’t even trying to make something with posting it in mind, I was just trying to make “something” for dinner, but it was so good I had to share it. I have to say that this is definitely better then takeout. Enjoy! Combine corn starch, salt, and pepper. Prepare a bowl with beaten eggs, another with panko bread crumbs and another with corn starch. Dip chicken in egg mixture, dredge in cornstarch, then again in the eggs and finally in the panko bread crumbs, set aside. Heat pan with vegetable oil to 375 degrees, fry chicken in batches until completely cooked. 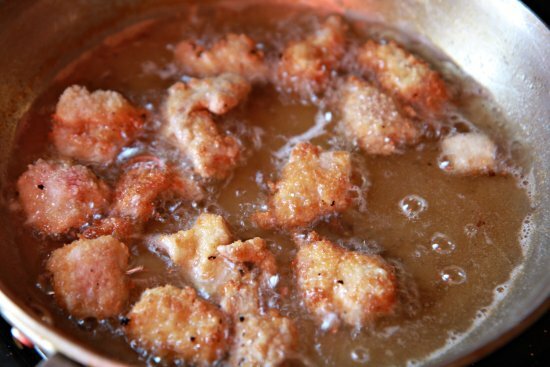 In a large saucepan combine 1 ½ cups water, orange juice, rice vinegar, and soy sauce. Blend well over medium heat for a few minutes. Stir in brown sugar, orange zest, ginger, garlic and red pepper flakes. Bring to a boil. Combine 3 tablespoons of cornstarch with 1/4 cup of water and mix thoroughly. Slowly stir cornstarch mixture into sauce until it thickens. 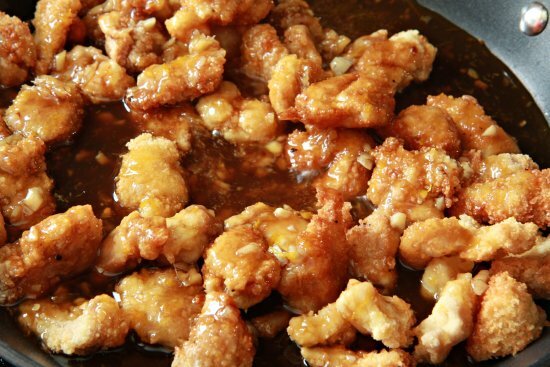 Pour sauce over breaded chicken, and if desired garnish with green onions. Did you know that you don’t need special fabric for the printer? Nope… you just need… Freezer Paper! Cut a piece of freezer paper the size of a 8.5 x 11 piece of computer paper. 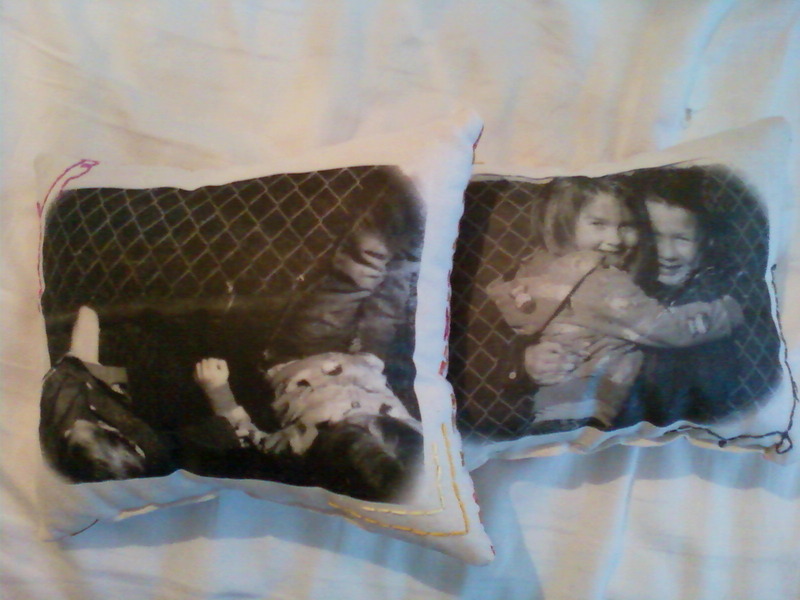 Then, just iron it on to the back of the fabric that you’d like to print the photo on. Cut the fabric to the size of the freezer paper after it’s been ironed on. I took my picture and put it on a word document so that I could size it to fill up the most of a regular sheet of paper. Put your freezer papered fabric into the printer so that it will print on just the fabric side (NOT the freezer paper). 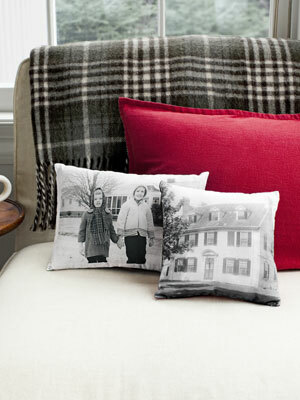 Sew two sides of fabric together to create pillow!